Take beautiful scenery, add exquisite meals and the company of brilliant, witty friends and you have the recipe for delight starring the riotously funny Steve Coogan and Rob Brydon and directed by award winner Michael Winterbottom. they retrace the steps of the Romantic poets' grand tour of Italy. During their drives and between bites of fine cuisine, the pals indulge in some sparkling banter and face off against each other with celebrity impersonations. Take beautiful scenery, add exquisite meals and the company of brilliant, witty friends and you have the recipe for delight in the The Trip to Italy , the highly anticipated followup to 2010's The Trip. The new film, again starring the riotously funny Steve Coogan and Rob Brydon and directed by award winner Michael Winterbottom, is booked for release December 23, 2014, by IFC Films via MPI Media Group. The Blu-ray will have an SRP of $29.98 and the DVD, $24.98. Michael Winterbottom's largely improvised 2010 film The Trip took actor-comedians Steve Coogan (Alan Patridge, The Look of Love) and Rob Brydon (Tristram Shandy, Little Britain) - or semifictionalized versions thereof - on a restaurant tour around northern England. In this witty and incisive followup, Winterbottom (The Killer Inside Me, 9 Songs) reunites the pair for a new culinary road trip, where they retrace the steps of the Romantic poets' grand tour of Italy. During their drives and between bites of fine cuisine, the pals indulge in some sparkling banter and face off against each other with celebrity impersonations. Re-whetting our palates from the earlier film, the characters enjoy mouthwatering meals in gorgeous settings from Liguria to Capri while riffing on subjects as varied as Batman's vocal register, the artistic merits of Alanis Morissette's "Jagged Little Pill" and, of course, the virtue of sequels. Winterbottom trains his camera to capture the idyllic Italian landscape and the gastronomic treasures being prepared and consumed while keeping the film centered on the crackling chemistry between the two leads. 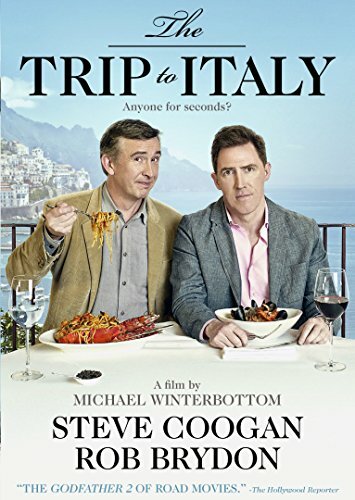 The Trip to Italy effortlessly melds the brilliant comic interplay between Coogan and Brydon into quieter moments of self-reflection, letting audiences into their insightful ruminations on the nuances of friendship, the juggling of family and career, and the inevitability of growing old. The result is a biting and moving portrait of modern-day masculinity. The film, an official selection at the Sundance Film Festival and the Seattle International Film Festival, received high praise upon its national theatrical release. Chris Nashawaty of Entertainment Weekly said, "At its heart, The Trip to Italy is more than just a travelogue about food. It's about friendship and the appetite for experience we all share." "The pair bicker cheekily and needle each other in clever, amusing ways," said Claudia Puig of USA Today. Variety's Scott Foundas wrote, "Coogan, Brydon and Winterbottom journey to the Mediterranean in this warmly enjoyable continuation of their improvised cultural and culinary adventures." "If it's your cup of tea, you're likely to spill it from laughing so hard. Somebody send these two on another holiday," said Tom Long of The Detroit News. Said Rick Kisonak of Film Threat, "Here's hoping Winterbottom doesn't wait another four years before cooking up a third course." A leader in the independent film industry, IFC Entertainment consists of multiple brands that are devoted to bringing the best of specialty films to the largest possible audience: IFC Films, Festival Direct, IFC Productions, and the IFC Center. IFC Films is a leading distributor of independent film. Its unique day and date distribution model, 'IFC In Theaters,' makes independent films available to a national audience by releasing them simultaneously in theaters as well as on cable's On Demand platform and through Pay-Per-View, reaching 50 million homes. 'IFC Festival Direct' features a wide selection of titles acquired from major international film festivals and offers them exclusively through Video on Demand. IFC Productions is a feature film production company that provides financing for select independent film projects. IFC Center is a three-screen, state-of-the-art cinema with luxurious seating and HD digital and 35mm projection that shows art-house films in the heart of New York's Greenwich Village. IFC Entertainment's companies are subsidiaries of Rainbow Media Holdings LLC.